Sometimes around Labor Day the weather pattern changes, bringing storms and enough rain to settle the dust. This year thunderheads piled up over the mountains, hammering the landscape with lightning and ferocious downpours. If a person is not too distracted by fire duty, they notice that the daylight hours are shorter and there is a hint of gold in the meadows. One of the more charming (to me anyway) aspects of early autumn is the emergence of fungal fruiting bodies–mushrooms. 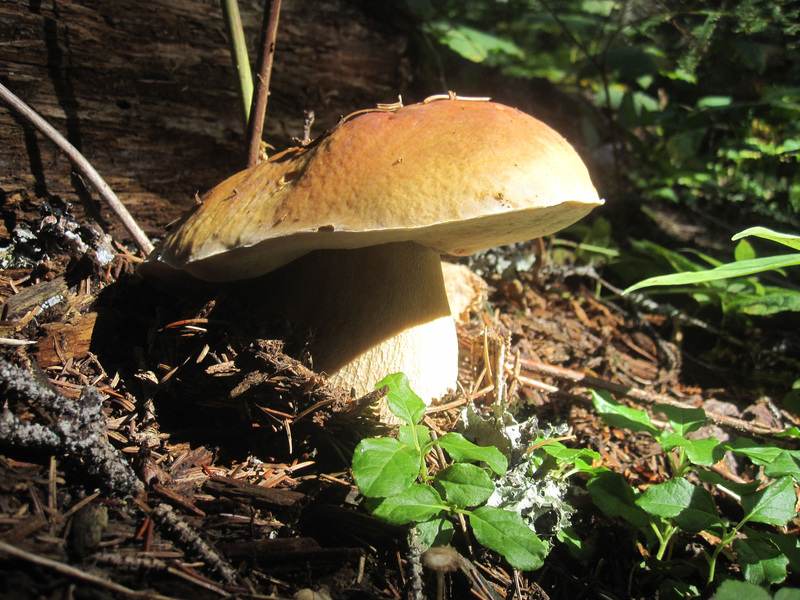 After rain and cooler temperatures, they magically erupt from the forest floor in a myriad of shapes, sizes and colors. The constant part of the organism lives under the surface, root-like hyphae extracting nutrients from rotting wood. When conditions are right, the fungus pops up to release spores into the air, spreading its kind around the woods. They range from jelly-ish and transparent to hard and woody, from tiny little things on the ground to large conks up in the trees. There is so much to be curious about and learn. I doubt that I will ever approach masterful knowledge of mushrooms. In the absence of expertise I have appreciation for how they delight my eyes and for their role in the complex forest ecosystem. If not for fungi and the slow work they do, we would be over our heads in dead tree stuff and other plant material. Spend the night at Hyas Lake with a group of volunteers working on the Pacific Crest Trail near the headwaters of the Cle Elum River. The sound of running water lulls me all night, a sound I would gladly sleep with for the rest of my life. 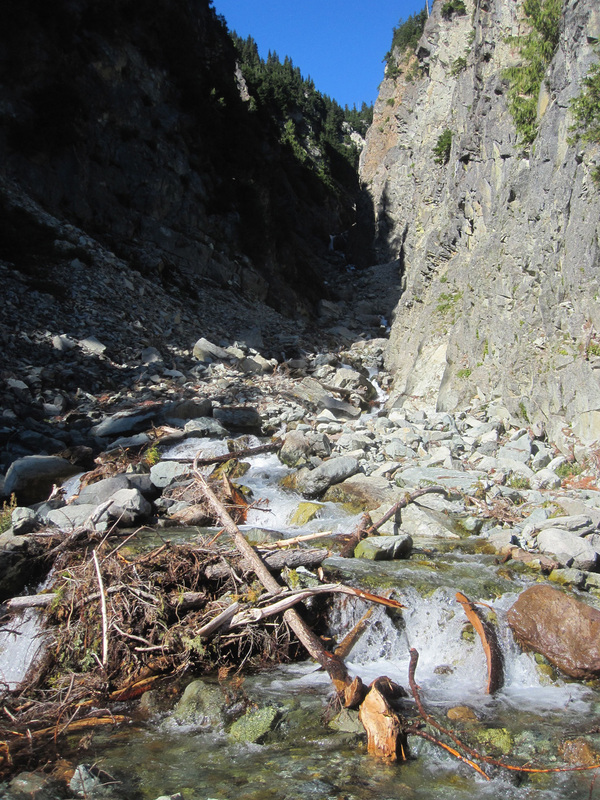 Fifteen hundred feet above where I sleep, a stream is born from snow melting on the side of Mt. Daniel. It gathers itself, pulling more from side streams until it rushes and tumbles over precipices and boulders. It plunges down a steep gorge, spreading out across a rocky debris field before plunging again. The boulders are the size of Volkswagen Bugs, and even Ford F-350 pickups. The Crest Trail crosses here. Every year the crossing is a little different, depending on how avalanches and rock slides have rearranged it. The creek has washed away the approach on the north side and hikers have picked a narrow path down to the water. Up and over the rubble, across the braided stream to the other side. I choose to change into wading sandals rather than try to cross dry-footed in my boots. When I think about it, I have never been a nimble stream jumper, even when I was younger. Halfway across, a young man points a camera up the gorge. He has the look of a through-hiker on his way to Canada, having hiked all the way from Mexico. He flashes me a radiant smile and asks what the crossing is like in high water. Not possible, I reply. People just have to wait till the water goes down. We chat for awhile. He has a British or Australian accent, and I can’t stop looking at how open and happy his face is. Here is someone who is truly paying attention to where he is. Washington is amazing, he tells me. The mountains are like the Sierras, except without the hype. It’s a reflective place. He’s just a week from the end of his hike and is taking this part slowly. I wish him well with all my heart as he continues north. Brent and I filter our drinking water from this stream. Working in the mountains all summer, we have become connoisseurs of good water. If there is a choice between cold running oxygenated water or water from some shallow flaccid pond, I don’t even have to think about it. We have our favored spots to filter from. As I work the pump and watch the water level rise in my Camelbak, I wonder about dissolved mountains. These rocks that cleave apart once lay flat on the bottom of the ocean and were thrust up onto the North American plate. Pressed, twisted, lifted only to be chewed and spit out by glaciers that shaped Mt. Daniel. The last remnants of alpine glaciers are melting now. Am I drinking ancient ice? What minerals are dissolved in the water? How much better for my body is this water compared to town water? I have always thought this steep gorge must be like the Himalayas. It’s so big and impressive that I can’t frame it in the camera. There’s no way to capture the sense of scale. Later, coming back down the trail to cross again on the way back to camp, I hear the high buzzy trill of the American dipper (Cinclus mexicanus). John Muir called it the water ouzel, a more poetic name for this rather plain dark gray songbird of clear mountain streams. I kept watching to spot one winging swiftly up or down stream, and at last one landed on a rock with its feet in water. Dipper birds have a habit of bobbing up and down while standing, perhaps to confound the aquatic insects that they prey upon. Life is good for them now, but I wonder what they do when the snow is deep? In just a few weeks, the valley will turn white. The stream will be buried–this part of the crest can receive twelve to sixteen feet. What do the birds do? I wonder if they fly down the mountain and find a place in the river where they can stake out a patch of open water? Wonder is a state of not knowing; of curiosity and mental querying; of astonishment and marveling. When I truly pay attention to where I am, I live in a state of wonder. A hundred different questions arise. Answers feel optional–it’s usually enough to just experience the wonder. The purpose of this trip is to cut the brush that encroaches on the trail, pushing hikers to the precarious edge of the tread. Our commute involves a shortcut straight up the hill from the valley floor. There is no trail, so we bushwhack. As bushwhacks go, it’s not bad because there aren’t many bushes. It’s possible to pick a route up through the silver fir forest to a pile of avalanche debris, cross the creek and then zigzag up the steep slope to the PCT. It took us a few tries to remember the way. Once at the worksite, we pull our tools from the brush where we cached them the day before. Brushing is not glamorous, not like cutting big logs with a crosscut saw and heaving the chunks off the trail. Brushing is tedious and we don’t use power tools in the wilderness. The trail goes across slopes kept open by avalanches, and the vegetation grows from talus with a skim of organic material on top of it. There is no real soil. Salmonberry, huckleberry, slide alder, and mountain ash grow prodigiously with all the sun and rain. If not kept cut back, thickets obscure the tread. In some places you can’t see where you are putting your feet. I’ve been doing trail work for so long that I no longer require glamour. It’s about the trail, not about me. I can get into my zone with a pair of loppers, mowing a swath from the top of the cutbank to the middle of the tread, stopping periodically to gather an armload of vegetation to fling off the trail. Then I scrape to re-establish tread. When I turn back to look at the completed work, there is a real sense of satisfaction. I can see what I have accomplished, and what my colleagues have done. I have cut brush here before, and I know it grows back. But for a little while, the trail is clear. Passing backpackers thank us sincerely. It’s a group effort, righteous work. Last time down the shortcut to pack up camp and head out the Deception Pass trail. It’s not until today that I realize it was September 11th. Hm. Glad I missed the hype. 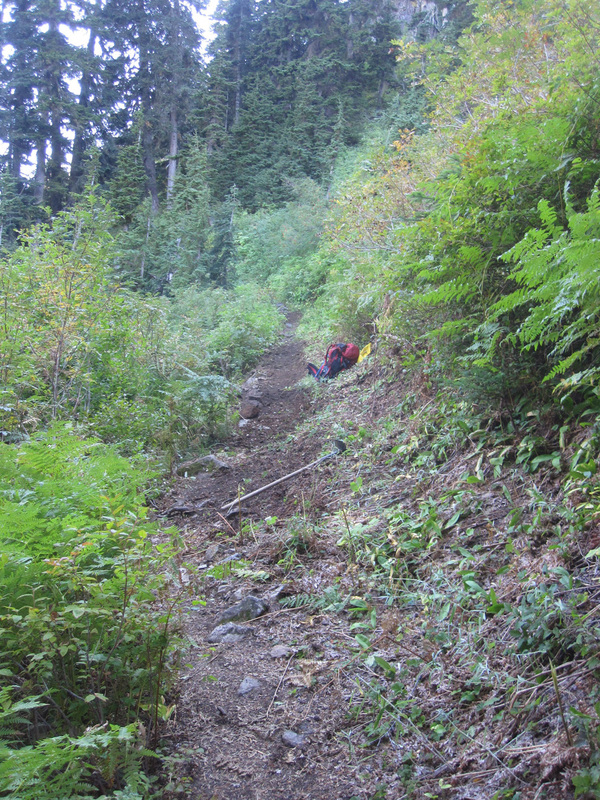 Oddly enough, it was the Deception Pass trail that the trail crew was trying to reach on that day in 2001. There was a sense of just needing to get out to the wilderness where things would still be “normal” in a world that had otherwise started falling apart. We were called back to help with firefighting, but got to Hyas Lake a few days later. I remember how quiet and solemn we were, and how a sense of sanctuary wrapped around us in the brilliant mountains where water ran free and no planes flew over for days. Home now, to reflect on the season which is somewhere between summer and fall. The days have gotten warm again. I hear the rushing sound of another field season constricting and closing. It’s not over yet, but it’s turning, turning. Day 2: Sounds like the Danials Ford. An interesting crossing. Day 3 I have brushed that trail north of the ford several several years back. Hiked in via Decption Pass and out the same day. Exhousted. Hi Deb– Your question about the American Dipper in winter prompted me to look it up in “Birds of Washington” a wonderful reference book by Terence Wall and others. They show a substantial “year round” range below the subalpine zone. The dippers also move downstream a little to escape frozen rivers. They are as hearty as the golden-crowned kinglets! If you don’t have this book, I highly recommend adding it to your natural history library. The other one I like (that does not apply to dippers in this case) is “Neotropical Migratory Birds: Natural History, Distribution, and Population Change” by DeGraaf and Rappole. It helps me answer the question of where our local birds go in the winter. Love your blog!! Keep it up. Cool! Thanks, Lisa. I’ll definitely add those to my wish list. I appreciate your reading, and your comments.